Morija Guest Houses - Morija Accommodation. The main Morija Guest House, perched on a rock and offering superb views, can accommodate 16 guests. Built of sandstone and thatched with local grass, it blends beautifully into the environment. 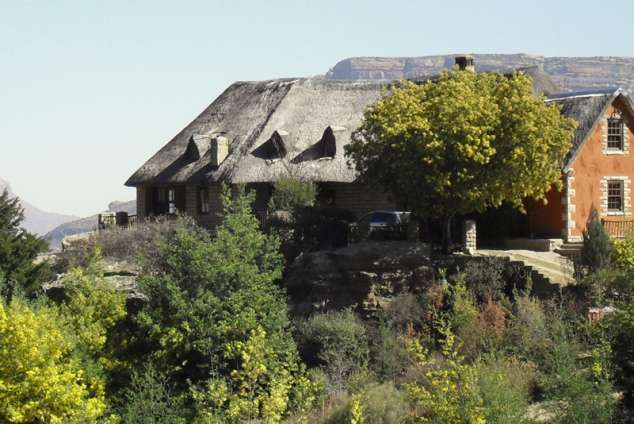 Below are two cottages built in the traditional Basotho style that can welcome 8 more guests. Most of our bedrooms are twin rooms but we also have 2 doubles, 4 singles and 1 family room (for 4). The bedrooms are rustic but comfortable and tastefully decorated. Bathrooms are shared (1 bathroom for 4 guests maximum). The large dining-room and lounge of the main house can welcome up to 24 people. Visitors can choose between having the delicious meals we offer or cooking for themselves as the houses are equipped for self-catering. We sell drinks as well as snacks on an "honesty bar" system. There's a TV in the lounge (no DSTV) and a choice of videos and DVD’s. Wifi is available to guests in the main house, at a small cost. Moshoeshoe I International Airport (with flights to and from Johannesburg) is 25 minutes’ drive away and we can pick up guests. We organise guided hikes (mostly to a nearby rock bearing dinosaur footprints or to the top of the plateau) or horse rides and the historic town of Morija is worth a visit. Visitors can also go for a village sleepover, after a 4-5 hours’ hike or horse ride, and experience Basotho village life. We are proud of our welcoming staff, our homely atmosphere and our commitment to Eco-Tourism. 2267 page views since 17 Jun, 2015.